NIVEA for Men wants to bring back Vegas' glory days, when dapper dudes dominated the desert, instead of today's slot-squatting grandmas and bused-in buffeters. 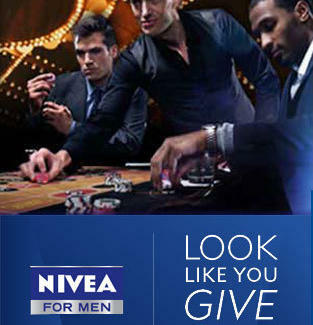 Join their crusade via NIVEA For Men's "Look Like You Give A Damn" Las Vegas Weekend Sweepstakes. Like NIVEA for Men's USA Facebook page, and you could win a weekend of lavish living at the Aria Resort & Casino, giving you three days to resurrect Vegas' aesthetic heyday in your own modern-man-of-the-world style, plus plenty of NIVEA for Men to take care of the grooming. In addition to primo accommodations, you'll gain access to six crazy-awesome bashes that'll have you bouncing to Brit beats at a Mark Ronson concert, and soaking up rays at NIVEA for Men's fun-/sun-fest in Aria's Liquid Pool Lounge -- a far more popular hang-out than its counterpart, Solid Pool. The weekend concludes with Sunday's Send-Off at the Todd English P.U.B. in Crystals, the luxury entertainment center, not a pair of hot twins with very unimaginative parents. Enter to win by liking NIVEA for Men's USA Facebook page, then scope their shaving arsenal, because you should always look better-groomed than whatever that thing is lurking in the Keno room.